This square profile has been cold drawn by a round pre-material. During the production problems appeared in the form of corner cracks. 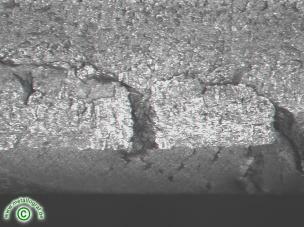 The material showed a well spheroidised annealing structure, with strong carbide precipitate on the grain boundaries. A structure with strong grain boundary precipitations in the area of the broken corner also became stated. The structure at the three corners without breaks had, however, only low grain boundary precipitations. The flanks of the defects didn't show any decarburization, so they had arisen after the last heat treatment. The different corner form can be seen in the dissimilar forms of the microstructur. Bad flow behavior at the drawing.